Imagine enjoying a candlelit five-course gourmet meal prepared by some of the best up-and-coming South Florida chefs…under an outdoor gazebo of lights…on a fully functioning organic farm…while the rest of the country freezes through another winter, or that time of year we commonly refer to as our “season” in South Florida, because the weather is almost always perfect for an occasion such as dinner al fresco. 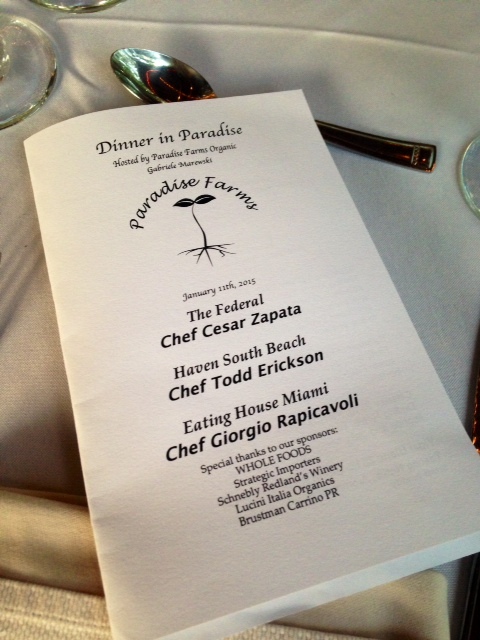 This past Sunday marked the first of nine scheduled “Dinners in Paradise”, which take place on the beautiful grounds of Paradise Farms in Homestead, FL in South Miami-Dade County. Paradise Farms is a working organic farm that utilizes many biodynamic principles as farming techniques. Biodynamic farming encourages an intimate relationship with the land based on the energies of the sun, moon, and universal cosmos, and is a step up from organic in its natural approach to agriculture. The farm is completely vegetarian, meaning that no meat or meat products are allowed on the grounds. All planting and harvesting on the farm is done by hand, and no chemicals are used in the growing process—only organic material, love, and care. 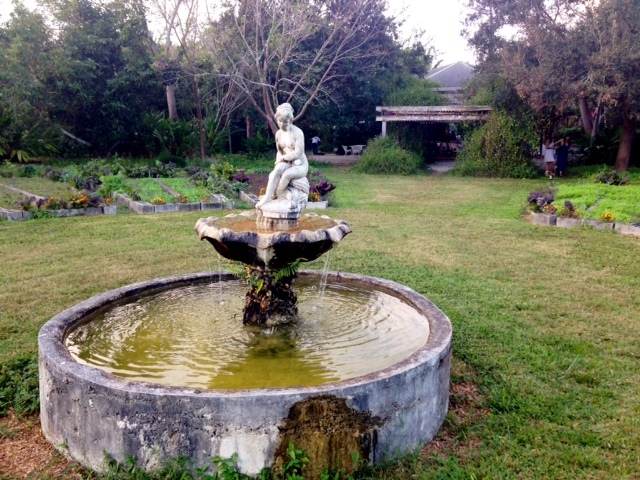 On select Sundays between January and April, Gabriele Marewski, owner of Paradise Farms, invites gourmet chefs from some of the top restaurants in South Florida to come to her farm and prepare a delectable meal using many of the plants grown on site. The combination of healthy, natural food, ambiance, and location creates an incredible dining experience for an intimate group of guests. It is hard to find a more authentic farm-to-table experience than when the table is located on the grounds of the actual farm. The first dinner of the season featured three of the finest chefs in Miami: Chef Cesar Zapata from The Federal Miami, Chef Todd Erickson from Haven South Beach, and Chef Giorgio Rapicavoli from Eating House Miami. 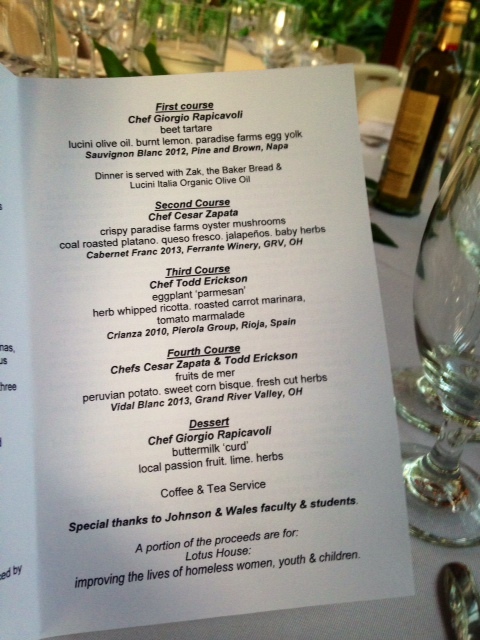 Each chef was responsible for creating a course, and/or collaborating to create a dish. 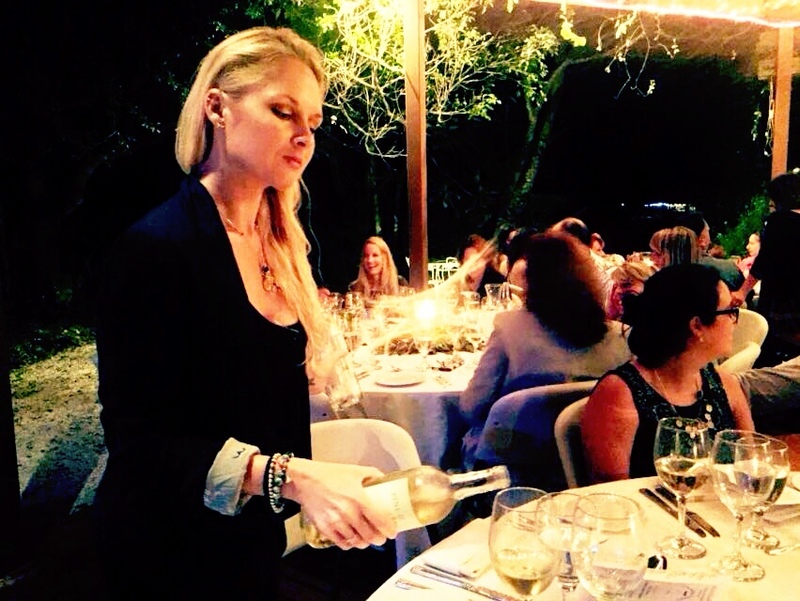 Each course is perfectly paired with a wine supplied by South Florida-based distributor, Strategic Importers. Shari Gherman, President of the American Fine Wine Competition, is the Wine Director for the dinner series. She works closely with the owner of Strategic Importers, Alejandro Ferrari, to pick the best wine from his premium portfolio to pair with each specific dish created by the chefs. The expert pairings of the wine with each individual course will amaze even the most discerning of food & wine critics. As a special touch to this year’s dinner series, these rare, small-batch premium wines are available for immediate purchase following the dinner. If you care to stay on the farm during your visit, there are several rustic bungalows on site for rental in advance. If you decide to be adventurous the morning after your whimsical dining experience, there are also bikes available to rent and ride around to other local attractions such as nearby Schnebly’s Winery, which supplies the cocktail hour sparkling fruit wine for enjoyment by dinner guests. The “Dinner in Paradise” experience truly lives up to its name. Unlike any other fine dining experience, these evenings provide a unique opportunity to learn about and tour a working organic farm, while famous chefs prepare a gourmet five-course dinner for you to enjoy under the stars and palms of South Florida. To learn more about Paradise Farms and how to reserve your spot for a Dinner in Paradise, please visit the Paradise Farms website. Spaces fill quickly for the dinners, so it is important that you reserve in advance. 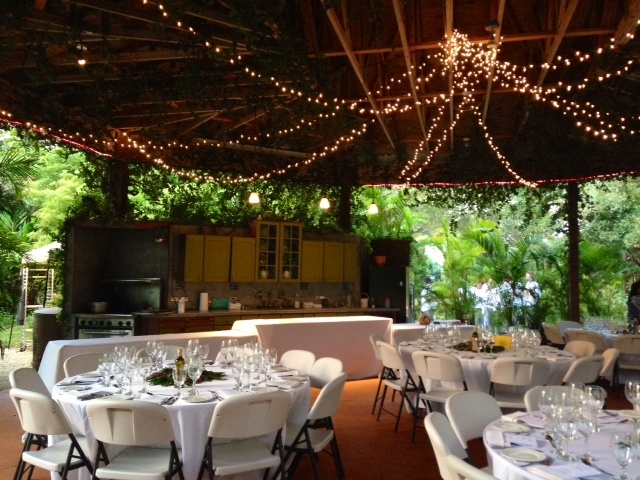 Come to Dinner in Paradise for a Lovely Food & Wine Pairing Experience!